We tackle a bi-objective dynamic orienteering problem where customer requests arise as time passes by. The goal is to minimize the tour length traveled by a single delivery vehicle while simultaneously keeping the number of dismissed dynamic customers to a minimum. 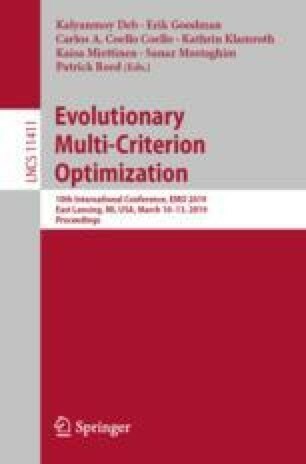 We propose a dynamic Evolutionary Multi-Objective Algorithm which is grounded on insights gained from a previous series of work on an a-posteriori version of the problem, where all request times are known in advance. In our experiments, we simulate different decision maker strategies and evaluate the development of the Pareto-front approximations on exemplary problem instances. It turns out, that despite severely reduced computational budget and no oracle-knowledge of request times the dynamic EMOA is capable of producing approximations which partially dominate the results of the a-posteriori EMOA and dynamic integer linear programming strategies. J. Bossek, C. Grimme, S. Meisel and H. Trautmann acknowledge support by the European Research Center for Information Systems (ERCIS).